With temperatures all around Australia being at an all-time high, going for a swim in your backyard pool has never felt better. However, it’s not really wise to do so at peak temperatures, which leaves many pool owners to have to resort to enjoying their pools late in the day and in the evening. But then another problem arises – you might not have the best visibility in and around your pool, which can lead to slipping and accidents. The solution to this problem? Swimming pool lights. If you’re new to buying swimming pool lights, then worth knowing is that choosing the right ones is essential. Most owners want their pool lights to enhance the aesthetic appeal of their pools and property, as well as the utilitarian value they offer. With that said, there are a couple of important factors to consider when shopping for pool lights. The first thing you need to consider is the type of light you want. 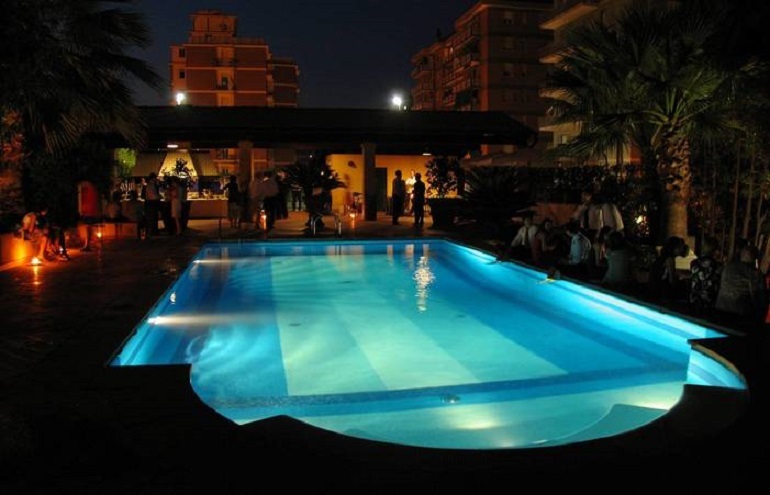 Most modern pools accept 12V or 120V traditional and LED lights. If you’re replacing burnt-out bulbs, check them for the right fittings, otherwise, check with the owner manual. Most pool light fixtures are designed with a coil mechanism which allows for convenient repair and maintenance. LED lights are the preferred option as they illuminate very brightly, consume very little energy and run for a long time. Additionally, LED pool lights come in a wide range of colours, which is one of the main reasons many homeowners who own a pool opt for them. Some advanced models can even be programmed to change colours in many different patterns and rhythms, which can be an attractive feature to have if you enjoy throwing poolside parties. Most people can change the pool lights without the help of professionals. But if you aren’t handy, you should definitely seek professional help. Generally, the process goes something like this: You switch off all the electricity at the breaker level, then pry out the light out of the niche. Bring the fixture to surface level and remove all the clamps and screws that hold it to the glass or plastic cover. Once you do that, cover the bulb with a soft and twist it counterclockwise. Wipe out any moisture that’s left on the caging and put the new bulb into the light fixture. After you do that, turn the power on briefly to check whether the bulb is working properly. If it is, turn the electricity back off, and replace the cover and caging. Use a brand new light gasket to prevent water from entering the caging, as that can cause corrosion. Place the light back in the pool, and see whether bubbles appear. If they do, that means you haven’t installed it properly. If there aren’t any bubbles, you’re good to go. Lastly, put the light back in the niche, press it in place and screw the caging. You’re good to go!